Which Shoot Will Your Ball Come Out Of Next? 4 chutes, each uniquely colored and numbered. Various scoring options - Or play math skill games! Keep players guessing which chute their ball will come out of next! 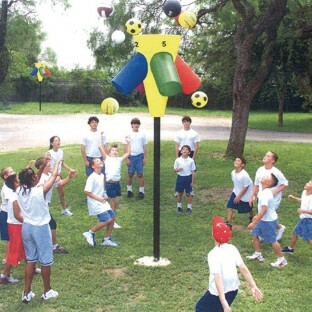 This molded, weather-proof plastic goal features 4 extended-length chutes, each uniquely colored and numbered for various scoring options and math skill games. Use any ball – volleyball, soccer ball, etc. – up to basketball size. Long chutes eject balls 10 to 20 feet out. 3-1/2" diameter steel post can be set up to 6-1/2' or 10' tall. Installation required. Includes 6-game activity guide. Don't pass up the chance for hours of unpredictable exercise fun!